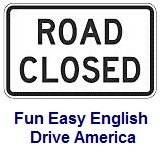 ﻿ Fun Easy English - Drive America - United States of America road signs, rules, and regulations guide, recreational facilities. Recreational and cultural interest area signs for facilities provide information about camping, picnicking, and other activities in a designated area. Camping is very popular in America but the rules and regulations at the campsites can be very strict. Be sure to follow the rules to avoid a possible fine, or even worse, getting your car taken away. Hiking and sleeping shelter to the left. Parking and amphitheater to the right.